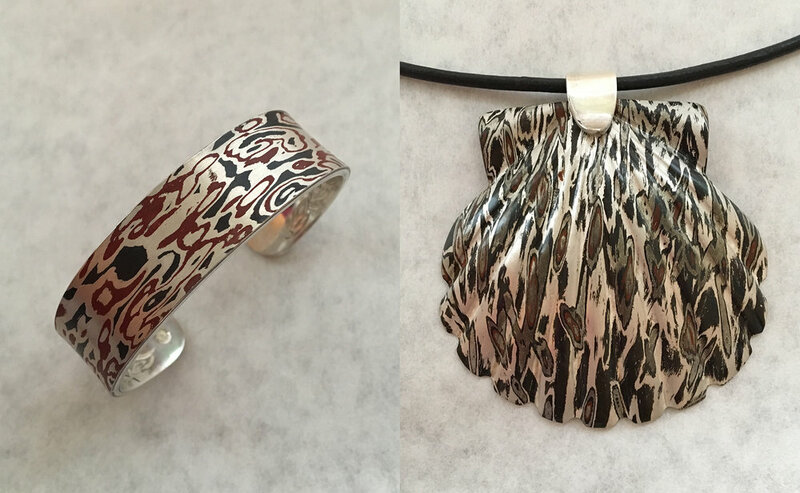 Two pieces of jewelry by Jerry Blanchard show the striking layered effect of the Mokume Gane process. On Craftsmanship • by Jerry Blanchard, Earl Bushey and Gene Novagratsky | Mokume-Gane was invented by the great Japanese artisan, Denbei Shoami (1651- 1728) who worked in the Akita Prefecture of Northwest Japan. The literal translation is Wood Eye Metal, or Wood Grain Metal, because the patterns often resemble wood grain. The Japanese have long appreciated nature in their art and craft, and the natural forms possible with Mokume-Gane were, and are, much admired. Much of Denbei Shoami's Mokume-Gane work was for sword hilts (tsuba) and various fittings for swords that were such an important part of Japanese culture. After the abolition of the the Samurai, artisans made a wide variety of other objects from Mokume-Gane, vases, clasps for pouches, bowls, tea kettles, etc. Fig. 1: Billet in the forge: note the small observation window in the coating on this billet. Color and other changes in the metal can be seen here. Mokume-Gane is a technique of fusing layers of different metals together without using solder and carving and forging them in ways that produce beautiful patterns. Mokume-Gane pieces were discovered and prized by westerners in the late 1800s, but the closely guarded techniques of making it were not fully understood. English artisans working to imitate Mokume-Gane assumed the layers of metal in Mokume-Gane were joined with solder, and some of the early books on metalworking published incorrect information about technique. Fig 2: Forge with angled fire bricks deflecting the flames and with the center burner removed. 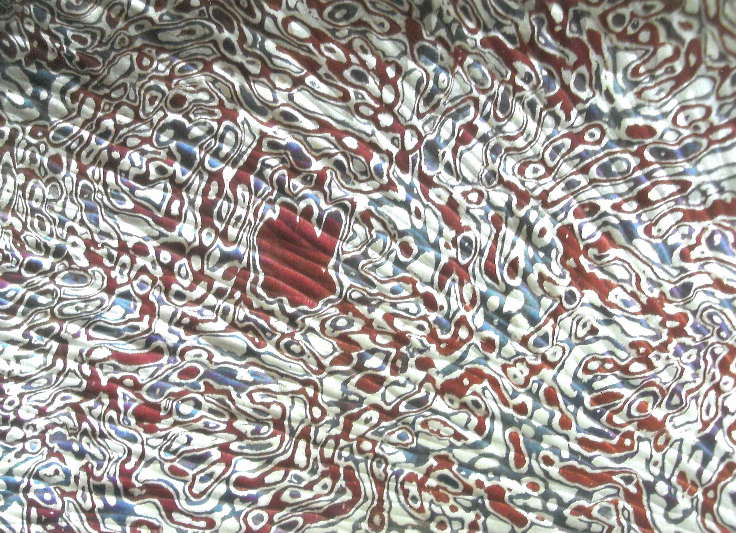 Mokume gane has always been a challenging art practiced by only a few craftsmen. Hiroko Sato-Pijanowski who in the 1970s helped introduce Mokume-Gane techniques to western artisans says today only about 20 people in Japan still make Mokume-Gane. Earl Bushey introduced me to the making of Mokume-Gane, and Earl, Gene Novagratsky, and I have worked together making Mokume-Gane one day a week for many years in Gene's big studio. Fig. 3: Torque plates and copper cooling blocks. Slots in the plates allow easy removal of bolts after hot pressing. Note the smaller square pads that make for easy flat grinding. We have different approaches to the process, but we share the alchemy of its exploration. 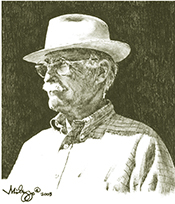 For the most part we have not collaborated with others in the field, but we were fortunate to have the guidance and wisdom of Toshi and Etsuko Kawai while they lived in Santa Cruz. The following article will explain our use of the gas-fired blacksmith forge for fusing billets. We prefer to use the gas forge because we can watch the entire process of fusing, and because the flames produce a reducing atmosphere that helps limit oxidation of the metals. (Fig. 1 and Fig. 2) Before we used a gas forge we experimented with torches to fuse Mokume-Gane to see if this would work. It worked perfectly, but had limitations. Fig. 4: This billet will be compressed about 3mm before the bolts are removed. The steel blocks give clearance for the bolts. The gas forge is easier to use with larger billets than the torch method. The forge we use is from Centaur Forge in Austin, Texas. We use a model #NCADDY2. It is designed for propane gas, but can also be converted to natural gas usage. We removed the center burner of the three in the burner manifold in order to reduce the heat to a desired level. A somewhat slower rate of heating evens out temperature differences within the billet, which improves the bond. It also gives us more time to observe the subtle signs as billets go through the various stages of reaching fusing temperature. These include, the nature of the flames, color and brightness of the torque plates and billets, and eutectic flow. Fig. 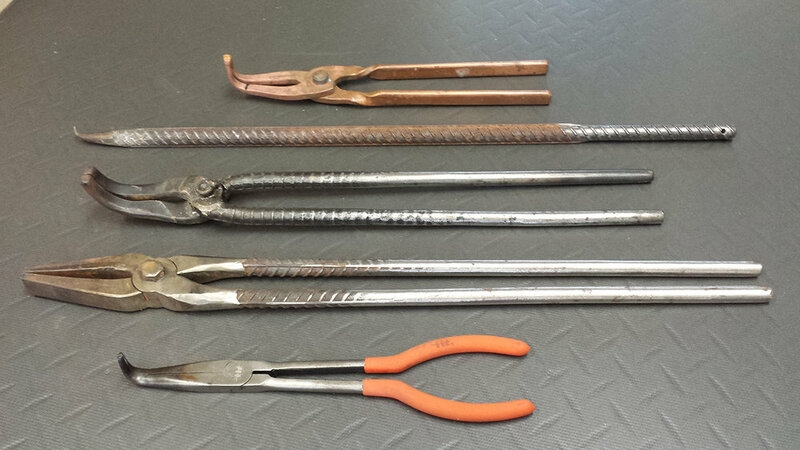 5: From top, heavy copper pickle tongs, billet turning hook, right angle blacksmith tongs, duckbill blacksmith tongs, small right angle tongs. Wedge shaped firebricks are placed in the corners of the furnace so the flames from the burners in the top of the furnace are deflected sideways for more even heating, especially underneath the billets. It is also very important that the interior bottom of the furnace be perfectly level, so the layers in the billets do not slide about when they reach bonding temperature. Fig. 6: Turntable on the left fits on the forge floor. At the right, the upside down torque plate engages the pin on the turntable. An essential component in our billet making is the torque plate. (Fig. 3) We make torque plates of mild steel in various thicknesses from 1/4 inch through 1/2 inch thick, depending on the size of the billet and the particular application. We often fuse smaller steel plates to the main plates to make belt grinding them perfectly flat easier after each firing. We use high tensile strength fine pitch socket head bolts of 1/4, and 3/8 inch diameters, depending on the size of the billet. The torque plates are slotted on their sides, which allows the bolts to be quickly lifted out with tongs when the hot billets are squeezed a bit in the hydraulic press right after bonding. We feel that pressing the hot billets improves the bonding of the layers, and it also loosens the bolts and allows them to be quickly lifted out with pliers. (Fig. 4) To keep the billets from sticking to the torque plates we have used various methods, and have found water based Bic brand Wite-Out correction fluid works extremely well. Fig. 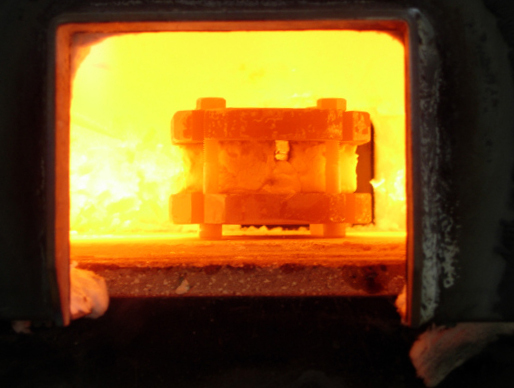 7: Electric melting furnace casting an ingot in a vacuum chamber. We have alleviated the problem of rapidly cooling a hot billet without undue thermal shock by using large blocks of copper, which have a high rate of heat conduction. We put one block on each side of a hot billet and lightly press them together in the hydraulic press for good contact. Ten seconds is sufficient to cool a 2" x 2" x 1” billet from red heat to touchable temperature. 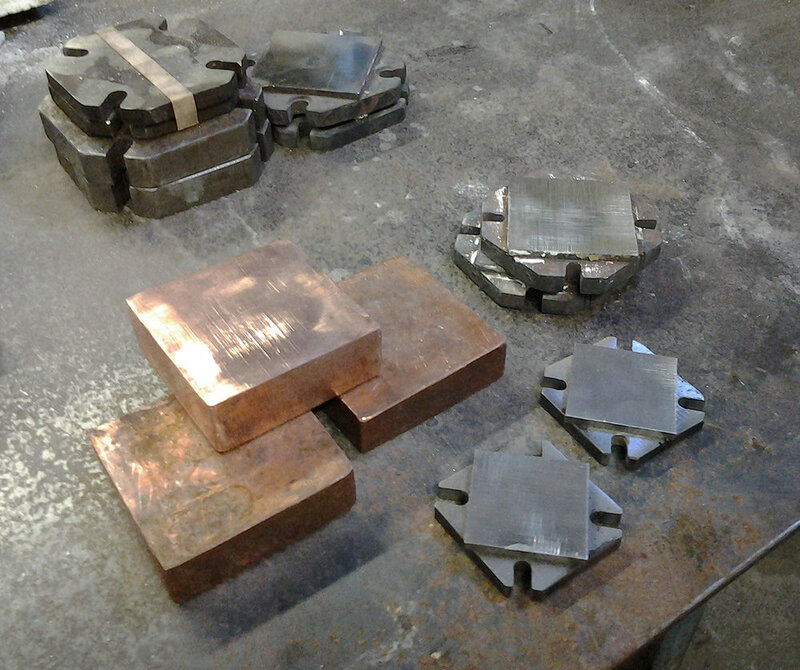 The blocks are made of fused scrap copper sheet, and measure about 3" x 3" × 1". Fig. 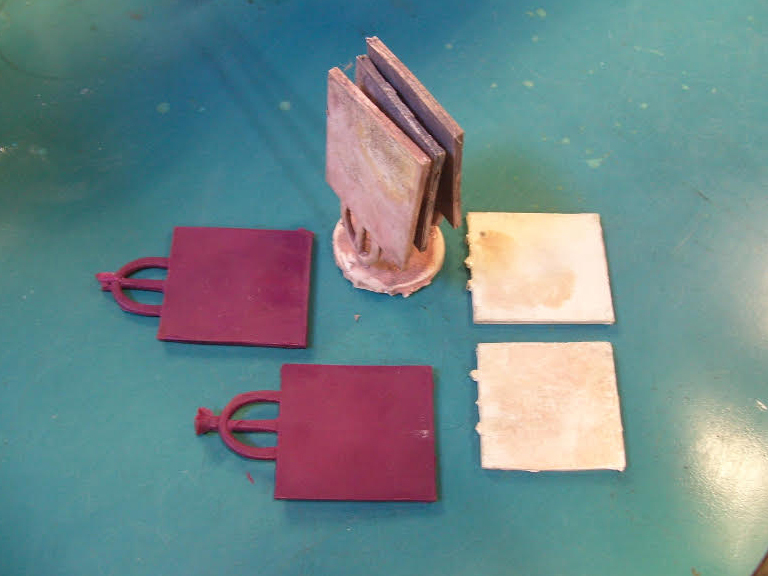 8: Injection mold waxes on the left, poured casting at the top, clipped cast ingots on the right. We use two methods of manipulating billets in the gas forge. One method is to flip our bolted billets with tongs and rotate them with a hooked rod. (Fig. 5) The second uses a "turntable" in the furnace. (Fig. 6) It is just a short flat-topped post of steel with a small integral cone in the center. The post is welded to a larger steel plate that is secured in position in the bottom of the furnace. 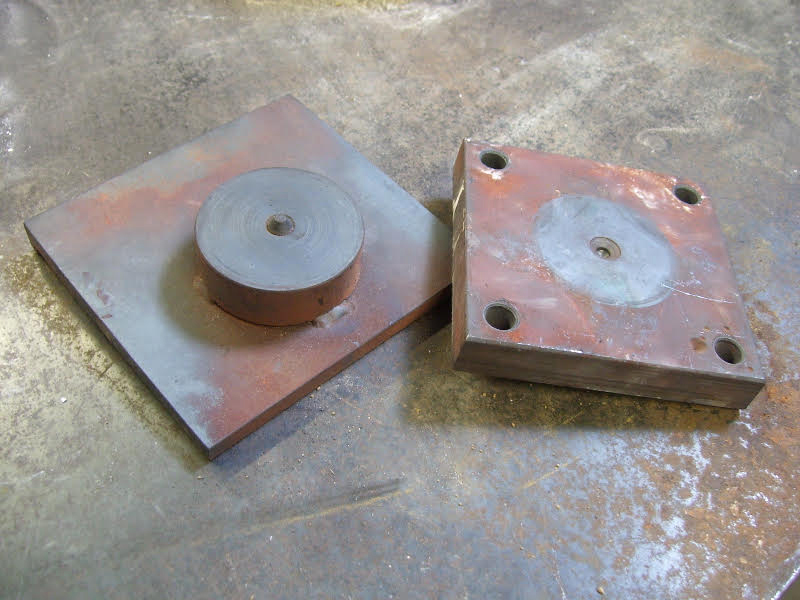 The torque plates for use with the turntable have small shallow holes that engage with the cone and keep the billets centered. The turntable raises the bolted billet up so the flames and heat can reach underneath. It is easy to slowly rotate the billet with a hooked steel rod so all sides of the billet receive the same amount of heat. The turntable is especially helpful for large, heavy billets that would be difficult handle with tongs. Fig. 9: Applying the carbon-rich coating on a high temperature fusing billet. Some of the traditional alloys we use are fine silver, copper, kuromido, shakudo, 950 silver, and shibuichi, in addition to other more exotic alloys. We have found that lower purity copper gives us better reds when patinated. We have experimented with many different commercial coppers and have found architectural copper used for gutters and flashing gives good results. We no longer use sterling silver in our billets, because the copper content in sterling oxidizes with repeated annealing, and the thin layers of sterling silver in those billets end up grey in color. We often make our own alloys and cast ingots to get desired patina colors when our pieces are finished. Fig. 10: Ribollita billet. The high temperature fused combination is in the center. 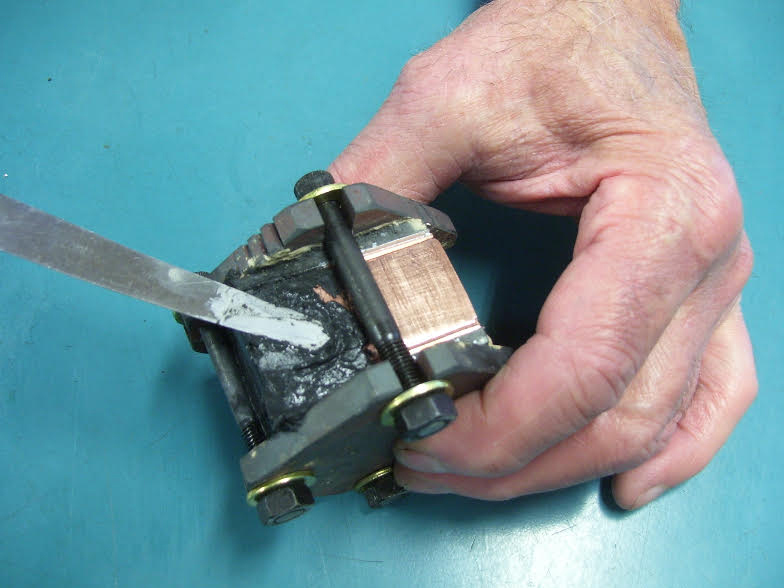 Low temperature fusing layers are added on top and bottom to form the new billet. Tsuba (Japanese sword hilt) of brass and copper mokume gane made by Earl Bushey.. This piece has alternating layers of the two metals all the way through the piece.The effect is of a piece of wood. The ingots are reduced to sheet by hammering them out. The metal has to be annealed periodically to keep it soft and pliable. It can be a very tricky job because the ingots are sometimes prone to cracking as the metal is moved. As it gets thinner the plate or sheet can be cut and run through rollers or further worked by hand. Detail of a bowl made by Jerry Blanchard showing layers of silver, copper, and kuromido. Kuromido turns black or grey when chemically treated. Our stacked layers of metal for billets are put between torque plates under 20 tons of pressure in the hydraulic press for good contact between all the layers of metal while the bolts are tightened. Billets that are bolted up but are not being fired immediately are stored in a vacuum chamber to stop oxidation of the metals. We have successfully stored freshly bolted billets for weeks in a vacuum chamber, and they bonded perfectly when fired in the furnace. The finished material is used to make jewelry, boxes and bowls as well as various forms of art metal work. The unusual surface look of Mokume-Gane makes it particularly suited for jewelry giving the pieces a striking and beautiful look.